Tuesday night, at the end of a campus-wide strike and a vote of the Occupy Cal General Assembly, the tents were back. This took place as police dismantled tents at New York and San Francisco occupation sites. Honest Chung was among the students university police beat last week. He addressed some 1,500 people from the Mario Savio Steps, in front of the administration building on Tuesday. At the evening General Assembly, on the steps and surrounding plaza, students and community members voted at 92 percent to re-constitute the encampment. Speaking in favour of the camp, a student identifying himself as Javan argued that the chancellor and police took down the tents, not because the tents disrupted learning, but because their presence is an effective and powerful way to build a movement that connects with other occupation movements and challenges corporate greed. The decision to reestablish the camp was followed by a talk by Robert Reich, former secretary of labour under President Bill Clinton and currently a professor of public policy at UC Berkeley. 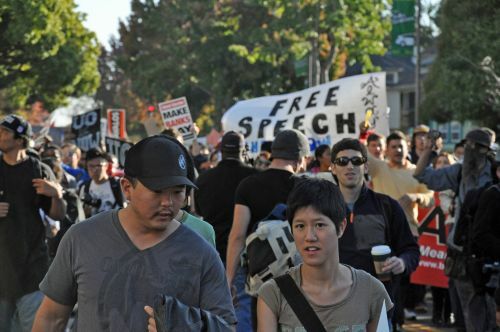 The long- planned talk, part of the annual Mario Savio lecture series, was to be given in a university auditorium, but organisers agreed to take the talk outside, where it drew upwards of 4,000 people. 'The sentiment and words of Mario Savio are as relevant today as they were then,' Reich said, going on to condemn the role of power and money in today's political climate, and arguing that the role of money makes it even more important to protect the rights of free speech. As most eyes were riveted on Reich as he spoke, students within the crowd quietly brought in tents and poles and began the erection of a new encampment. After the speech, the gathering broke into a celebratory mode, with music blaring from a loud speaker, dancing on the steps and soap bubbles floating in the air above the crowd. Earlier in the day, Occupy Cal marched through parts of the city of Berkeley, but before the march, Robert Slaughter, a student at St. Mary's College, addressed the crowd just outside campus. Slaughter, who is African American, was arrested Nov. 9, but separated from the other 38 arrestees and placed in a holding cell mostly with people accused of gang-related issues. A contingent of St. Mary's students joined the march in his support, saying his treatment in jail was based solely on the colour of his skin. A contingent from Occupy Oakland also marched about five miles to the Berkeley campus, arriving for the late-afternoon General Assembly. The Occupy Oakland encampment in front of Oakland City Hall was raided by police before dawn Monday morning. The arrests of 33 people were peaceful, in contrast to an earlier police response to the tent camp and demonstrations against the aggressive police behaviour during the raid on the encampment. Many of the occupants of the Oakland encampment joined a second camp about a half mile from the original one. Oakland officials have said it's illegal, but to date have made no move to disband the camp. About half of those arrested Monday were religious leaders who sat silently in front of the camp's Interfaith Tent. Protesters who did not want to be arrested had all left the camp before the raid. All were released soon after arrest, with the exception of Francisco 'Pancho' Ramos Stierle, a 36-year-old Oakland resident who faces deportation to his native Mexico. Stierle and two companions were arrested while sitting cross-legged and meditating silently in the plaza. Occupy Cal activists had planned to bus students across the San Francisco Bay to the Board of Regents meeting scheduled for Wednesday, where new fee hikes were on the agenda. The regents, however, cancelled the meeting, citing fear of 'rogue elements intent on violence' that would take part in the demonstration. In his speech to Occupy Cal on Tuesday, Honest Chung argued that the regents were part of the wealthy one percent. 'The big banks are directly connected to the university through the regents,' he said, pointing to a vice president of Wells Fargo Bank, a director on the board of Bank of America, and an investment banker who serve on the regents. A spokesperson for the regents did not return a call for comment.